Something huge just happened for those of us who fit significant numbers of Duette Progressive lenses. Previously, the center GP of the Duette Progressive lenses were only available in 0.2mm steps. Now they can be ordered in .1mm steps. The benefit of the .1mm steps is to better achieve the goal of fitting the Duette Progressive about .50D steeper than the flatter K.
In the past, having only .2mm steps sometimes led to problems with a few patients experiencing corneal molding at the end of the day (either steepening the cornea with a lens that was too steep, or flattening the cornea with a lens that was too flat). With the addition of 0.1mm steps the base curve of the lenses will now never be more than 0.75D steeper than the flatter keratometry value of the cornea, with the desired goal of .50D. This is not just important: it's critical! Aside from fixing the infrequent corneal molding that some of us have noticed, this will significantly improve the success rate from an optical perspective, by facilitating necessary centration of the lens. It all comes back to that esoteric measurement we last heard of in optometry school: angle kappa. If you remember, angle kappa is the difference between the patient's optical axis and the pupillary axis, and the two are never perfectly aligned. Figure 1. Representation of angle kappa. The pupillary axis is defined by the line that travels perpendicular to the pupil. The visual axis is the line of sight through the pupil (visible by the vertex scatter reflex on OCT). Now that we have 0.1mm steps with Duette Progressive, we can better align the base curve of the lens with the keratometry values of the cornea. By better aligning the base curve of the Duette Progressive with the eye, we achieve better centration over the cornea and better alignment with patients' pupillary axis. There is no easy clinical way to align a patient's multifocal contact lens with a large angle kappa. But, the best strategy is to align the contact lens with the pupillary axis and thereby catch the majority of patients who have a normal angle kappa. Therefore, centering the lens is your best method for improving success with Duette Progressive, and the expansion of parameters to .1mm steps will facilitate Duette Progressive alignment and centration. Figure 2. A decentered Duette Progressive clearly visible with NaFl dye pooling at the junction of the GP and soft skirt. The base curve of this lens is fit too flatly and needs to be steepened. Figure 3. A well- centered Duette Progressive lens. 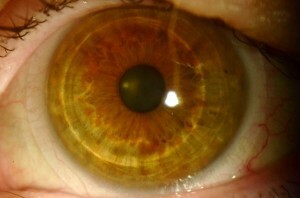 The near-centered optics are well aligned with the pupillary axis of the eye. 1. Hashemi H, KhabazKhoob M, Yazdani K, Mehravaran S, Jafarzadehpur E, Fotouhi A. Distribution of angle kappa measurements with Orbscan II in a population-based survey. J Refract Surg. 2010 Dec;26(12):966-71. 2. Choi SR, Kim US. 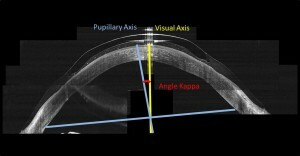 The correlation between angle kappa and ocular biometry in Koreans. Korean J Ophthalmol. 2013 Dec;27(6):421-4. doi: 10.3341/kjo.2013.27.6.421. 3. Moshirfar M, Hoggan RN, Muthappan V. Angle Kappa and its importance in refractive surgery. Oman J Ophthalmol. 2013 Sep;6(3):151-8. doi: 10.4103/0974-620X.122268. Review. 4. Karhanova M, Pluhacek F, Mlcak P, Vlacil O, Sin M, MaresovaK. The importance of angle kappa evaluation for implantation of diffractive multifocal intra-ocular lenses using pseudophakic eye model. 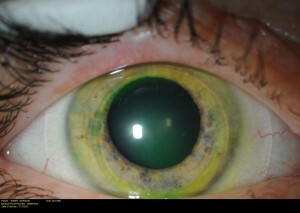 Acta Ophthalmol. 2014 Aug 27. doi: 10.1111/aos.12521.